The French for get stronger is the regular ER reflexive verb se fortifier. 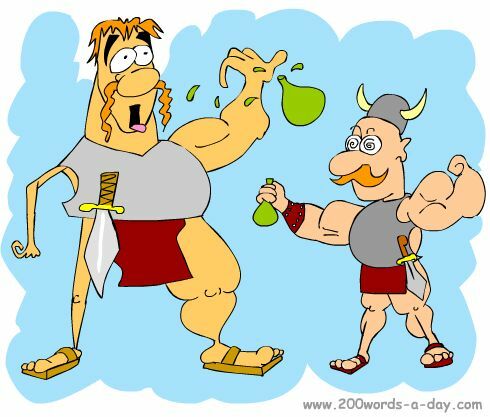 To remember this, imagine the Gauls FORTIFY themselves and get stronger on magic potion! se fortifier can also mean; to grow stronger. - fortifier (v) : to strengthen, to fortify, to do good. - la fortification (nf) : fortification (ie castle); barrier; ammunition. - fort/e (adj m/f) : strong. Learn French words with innovative memory techniques like Cartoon Memory Triggers. To remember a word, just think of the pic! and get stronger on magic potion! get stronger! fortifie-toi ! fortifions-nous ! fortifiez-vous ! ✔ se fortifier is a regular ER reflexive verb. There are over 5,000 ER verbs these being the most common verbs in French. ✔ Learn se fortifier and it will reinforce the pattern for ALL those other ER verbs. ✔ You can more easily remember words and verbs like the French verb se fortifier - French for get stronger - using the techniques of the world's Memory Masters. 200 Words a Day! Free Daily French Lesson Online - the verb in French for get stronger is se fortifier - fully conjugated. French Learning Made Fun and Fast with your free Daily French Verb Lesson - se fortifier.